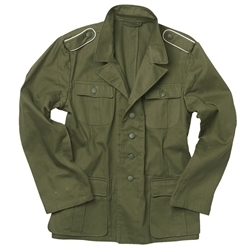 Reproduction of the German service WWII M40 Tropical Tunic issued to the Wehrmarcht. Excellent quality cotton twill fabric and color. Piping colors vary, sorry no choice. Marked in metric sizes, order your regular size…we’ve made the conversion. WWII M40 Tropical Tunic–The M40 features pleated pockets with scalloped flaps, cotton twill, split cuffs, shoulder board loops, no hook and eye at the collar, and reproduction buttons. U.S. Sizes: 38, 40, 42, 44, 46, 48.